The developed countries, particularly the United States, consume a disproportionate share of the world's resources, yet high and rising levels of consumption do not necessarily lead to greater satisfaction, security, or well-being, even for affluent consumers. This book is the second volume in the Frontier Issues in Economic Thought series, which provides surveys of the most significant writings in emergent areas of economics -- an invaluable aid in fast-growing fields where genuine new ground is being broken. The series brings together economists, sociologists, psychologists, and philosophers to develop analyses that challenge and enrich the dominant neoclassical paradigm. 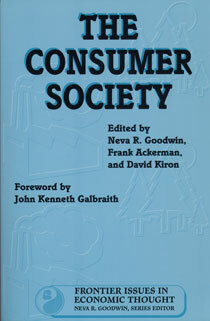 The Consumer Society is an essential guide to and summary of the literature of consumption and will be of interest to anyone concerned with the deeper economic, social, and ethical implications of consumerism. -Summary Of Will Raising The Incomes Of All Increase The Happiness Of All? -Summary Of Gender And Consumption: Transcending The Feminine?